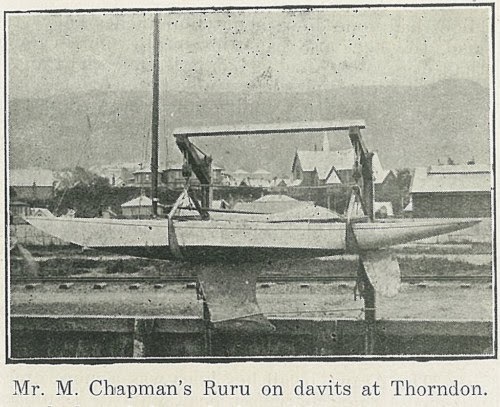 From time to time people have asked what was the fate of the crack boats of the Arawa Sailing Club written about here. I've found out about a few of them, as well as some additional bits and pieces about them so here is a short run-down with some different photos. 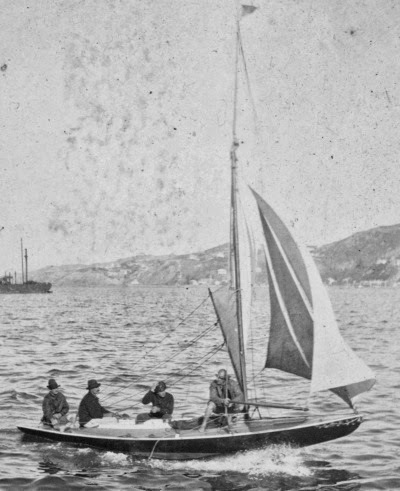 Vixen was renamed Waterbeetle and taken back to Lyttelton by Robert Scott. 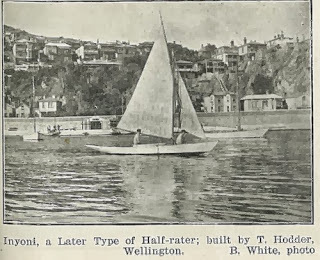 Beyond that, nothing much, though she had been altered and still going strong in 1916 at Banks Peninsula. 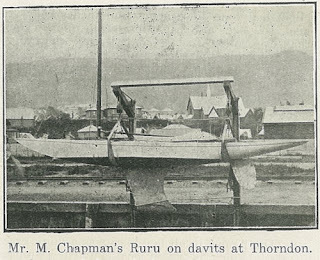 Ruru was converted to a 7 1/2 hp launch in 1907 by her owners messers Howard and Fear. The boat Inyoni pictured here I know nothing about. There were a few amateur-built half raters, but they don't get named in the newspapers of the day. 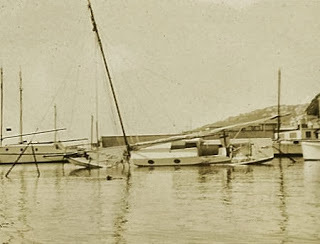 Jack Chalmers of Clyde Quay built Dauntless as an 18 footer in 1894, but racing in that class wasn't terribly interesting at the time. There was some excitement about the impending arrival of the half raters Vixen, Miru and Ruru built by Logan in Auckland, so Chalmers rather hurriedly converted her to race against them. The picture at left shows her in 1900, helmed by C. Petley. He removed the deck, and lowered the topsides by removing several planks she was decreased 12 inches forward and eight inches aft. This decreased her beam. Time was short, so he only had time to build a new shelf and cut slots for the deck beams. He didn't bother to trim the old beams down, and just jammed them in place. 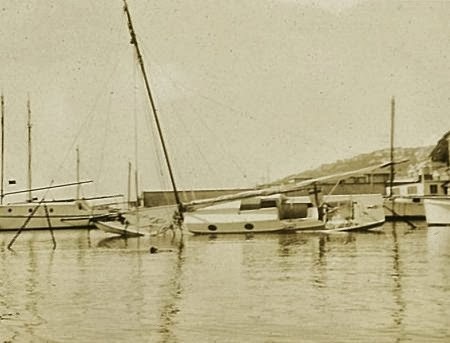 Because the boat was now narrower, something had to give - the forcing in of the now too-long deck beams pushed the bilge out and down; the turn of the bilge was four inches lower than the keel - almost like a catamaran. It also buckled the keel, giving her a more pronounced rocker - the banana shape keeping the stem out of the water off the wind. Chalmers also removed the bulb fin keel and inserted two dagger boards; one in the mid-section and one forward. 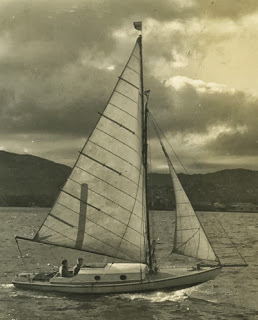 With no time to complete the job before the half rater season began, Dauntless was initially raced with no deck at all. The lack of deck meant she worked her hull quite badly, and water would come in through the hull as well as into it from breaking seas. During her second race she was constantly swamped. Unable to keep up with the water coming in, the crew ran her aground on the beach near Petone. Dauntless was the most successful of the half raters of the club. The Dauntless was still racing up to 1915 among third class boats with the Port Nicholson Yacht Club, and may be the same boat of the same name used during the 1920s at a lighthouse in Nelson. After that it's a blank. In about 1912 Miru was converted to a keeler, with topsides raised, a cabin added and converted to a sliding gunther rig. 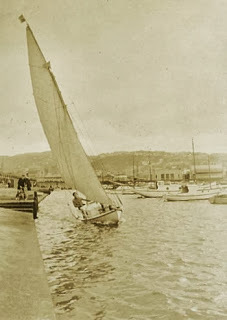 She raced in the second and third class fleets of the Port Nicholson Yacht Club for a few years. She was renamed Essex for a brief time during WWI. During the early 1930s she was purchased by a young RPNYC member and raced with some success in the years running up to WWII. The photos here were purchased from a second hand shop in Waikanae a few months ago and show her during the 1930s when she had a bit of success. Miru was still knocking around in Clyde Quay about 15 years ago I'm told. However, for most of the chaps about the waterfront these days, anything "15 years ago" just means more than ten, and anywhere up to thirty.